The grainy black-and-white photos offer an intimate look at a prewar middle-class European family. The girls celebrate birthdays, play in sandboxes and on the beach, hug a teddy bear. The images reveal no hint of impending catastrophe. Had she survived a Nazi concentration camp, the smaller girl in the photos, Anne Frank, would have turned 75 on Saturday. The exhibition of nearly 70 photographs, many of them never previously published or publicly displayed, is the focus of 75th birthday events at the Anne Frank House, the former canal house where Anne's family hid for 25 months. It is where the teenager wrote the diary that became the human voice of the Holocaust before the family was betrayed and captured in August 1944. Her birthday coincided with the widely celebrated 60th anniversary of D-Day, providing a sad reminder of those for whom liberation came too late. The 15-year-old Anne died of typhus at the Bergen-Belsen camp in March 1945, just weeks before British troops arrived at the gate. Theaters, Holocaust museums, churches and Jewish clubs around the world are commemorating the day with readings from "The Diary of Anne Frank" or performances of the play based on the journal. The Cleveland Opera is performing music inspired by the story. More than 100,000 Dutch Jews — 70 percent of the community — were deported to concentration camps after Germany occupied the Netherlands in May 1940. Most died in gas chambers, and were among the 6 million Jewish victims of Nazi genocide. "It's amazing when you think how much interest the diary created. That little girl — and she was only a little girl when she went into hiding — would be so shocked if she would have known," said Carol Ann Lee, a biographer of Anne and her father Otto Frank. Most of the photographs, first displayed in New York in May, were made by Otto Frank, a talented amateur photographer who snapped hundreds of candid shots of his daughters Anne and Margot — in days before photography was a widely practiced hobby. "What they show is that the Franks were a family like everyone else," said Eva Schloss, Anne's childhood friend. "They had a happy life. They did all the things children do," she said in an interview. Schloss recalls often playing with Anne after school. "I was more wild, a tomboy. She was more sophisticated. She was interested in clothes, in her appearance. She was careful with her hair. She was interested in boys," she said. Schloss and her mother also spent two years in hiding, moving from house to house, careful to keep their presence secret from the neighbors of people who helped them. They were betrayed by a Nazi sympathizer, a nurse who had infiltrated the Dutch resistance movement. They were sent to Auschwitz, where they survived nine tortuous months. After the war, Schloss became Anne's posthumous stepsister when her widowed mother, Elfriede Geiringer, married Otto Frank, whose wife Edith died in Auschwitz. Otto gave the young girl his Leica camera and sent her to London to learn photography. 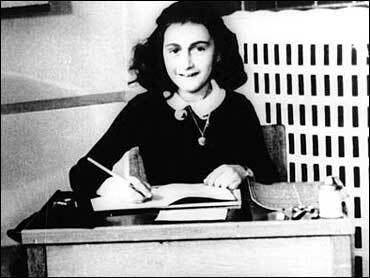 Anne began writing her diary on June 12, 1942, in a small album meant for autographs, one of her 13th birthday presents. Less than a month later, the family moved into a secret annex of Otto Frank's warehouse to escape the Nazi roundup. Her last entry was Aug. 1, 1944, three days before she was arrested. Miep Gies, one of four people who provided food and help to the Franks while they were in hiding, collected the notebooks and scattered papers that comprised the diary. Years later, she turned them over to Otto Frank, the only survivor among the eight people who hid in the annex. Frank published the Dutch version of the diary in 1947. It has since been translated into 55 languages, sold more than 25 million copies and is required reading by many U.S. schools. "She was an ordinary girl with an extraordinary talent," said her biographer, Lee. "I just can't believe she would have led an ordinary life."